They will be out October 16 . 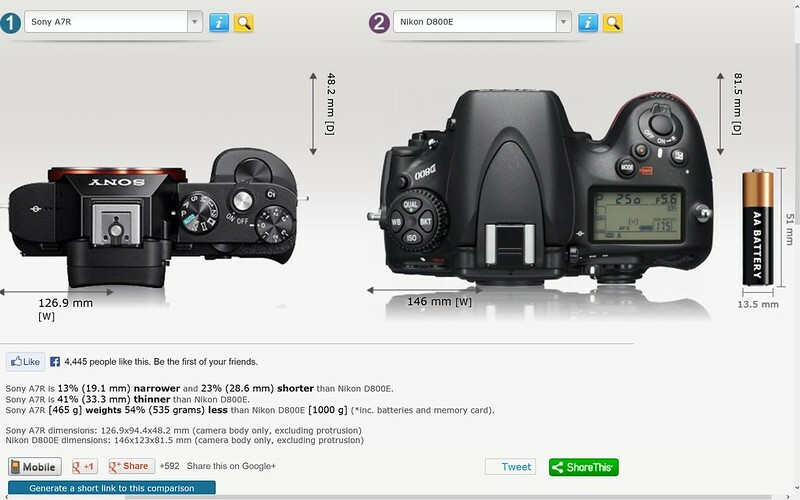 People on the other camera forums are amazed at how small the 36MP A7r is compared to the 36MP Nikon D800E that beat the 40MP Pentax 645D on the Pentax Forum ! Four years ago, Sony had not one, but two 24MP 'Full Frame' dSLRs, one for less than $2,000, with available Carl Zeiss autofocus lenses. If Sony knew how to sell these things, they could have taken the photography world by storm. But that didn't happen. Then Sony stopped making dSLRs and came up with a 'Full Frame' interchangeable lens camera with an electronic viewfinder, the A99, that could also use those Carl Zeiss autofocus lenses. But Sony still couldn't make any waves. Then Sony introduces a $2,800 Point & Shoot digital camera with a 'Full Frame' Sensor. It is a remarkable camera, but it didn't set the world on fire either. In amongst all this 'Full Frame' hoopla, some other companies were making some noise of their own with their mirrorless interchangeable lens cameras, and Sony wanted a piece of that action. They put their APS-C sensors in a narrow body and made a whole new lens mount for it. Because of the narrow bodies, the lenses had to bend light more in order to cover the entire image sensor, and the result was more distortion, vignetting, chromatic aberration, and field curvature, some of which they could compensate for with varying degrees of success, but sometimes introduced other flaws. What's surprising is that, even though this new line of cameras was more expensive and not as good as their original product line, it enjoyed some success. Sony finally found something they could sell. 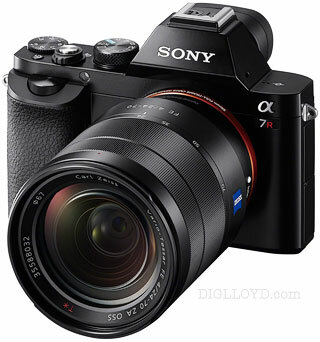 Now, Sony has married their 'Full Frame' sensors to their narrow bodies. The marriage requires new, more expensive lenses that must overcome greater obstacles in order to cover the larger image sensors. I don't get it. What is it with Sony's seeming fascination with 'Full Frame'? It's a lot more expensive and it requires bigger, heavier, more expensive lenses, yet it only does a handful of things that 'APS-C' can't, and most of those things most people don't need, and some people, if they really knew what they were paying for, wouldn't want. Certainly, Sony wants to sell 'Full Frame' cameras. They're expensive and flamboyant, photographic 'Bling', attracting attention from others. 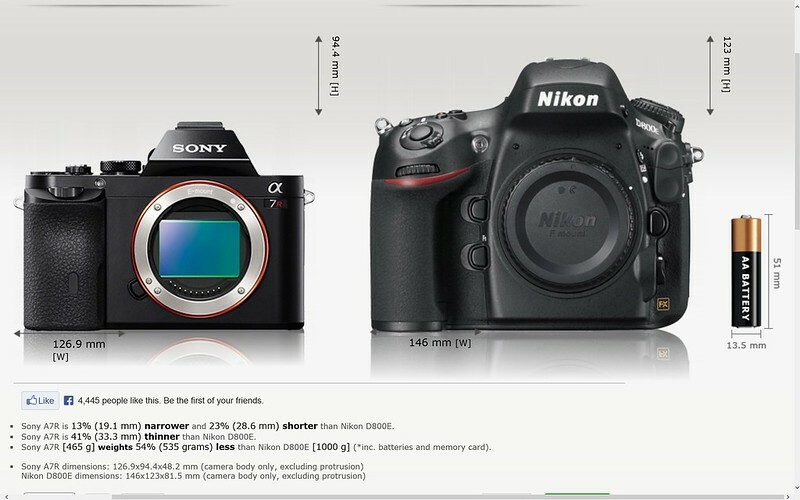 But what's the point of selling small 'Full Frame' cameras? What's the point of smaller 'Bling'? Sony also wants to sell 'Full Frame' sensors to other camera makers, and it has done well at that. 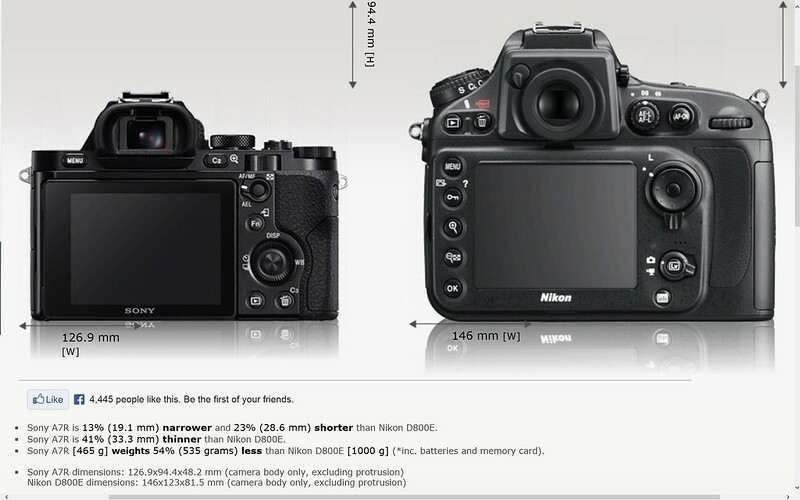 It's probably sold more 'Full Frame' sensors to Nikon than it has in its own cameras. But the 36MP 'Full Frame' sensors in one of the new 'Mirrorless' camera is customized to overcome some (but not all) of the shortcomings resulting from putting such a large sensor in such a narrow body. Nobody else would be interested in buying this sensor from Sony. The $2,800 RX1 can certainly be explained away as an intellectual exercise that may have enjoyed some commercial success. It's the most successful 'Full Frame' 'Point & Shoot' digital camera ever made, but some of that could be attributed to the fact that it's the only 'Full Frame' 'Point & Shoot' digital camera ever made. 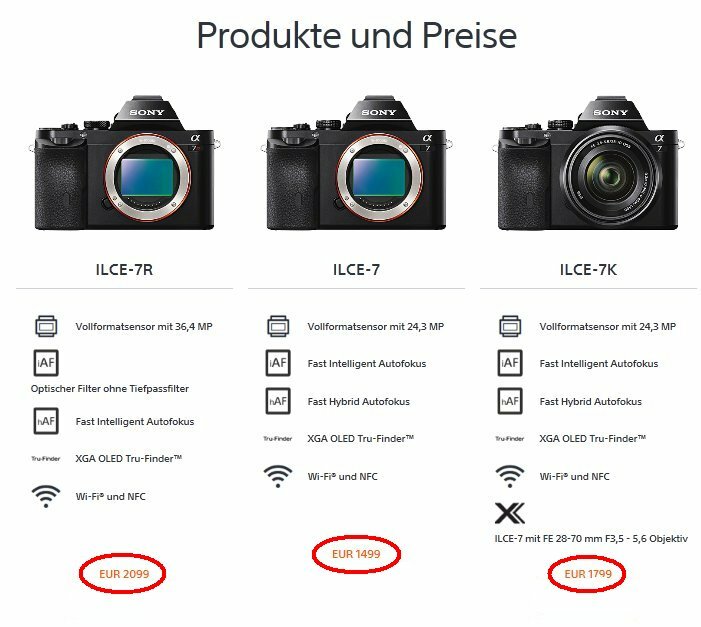 But why would Sony develop a whole new line of 'Full Frame' 'Mirrorless' interchangeable lens cameras requiring a whole new line of lenses, none of which contain any technology that Sony could sell to other camera makers. Sony can't sell its own interchangeable lens cameras with any measurable degree of success, and, as a multinational conglomerate, its biggest moneymaker is the image sensors it sells to other camera makers. Yet here we have some interesting new technology that no one else will be interested in incorporating in their own products. Where the other big brands are only toying with 'EVIL' camera's, (Evil because they mess up their line of dslr products). Sony has made a giant leap. Would I get a sony FF, no but that is because I don't need a FF, and they weigh to much, sorry weighed to much. Curiously,the lower res' "7" apparently displays better high iso performance than the "7R"- and focuses faster...!! Last edited by SIMON40; Oct 16, 2013 at 6:24 PM. 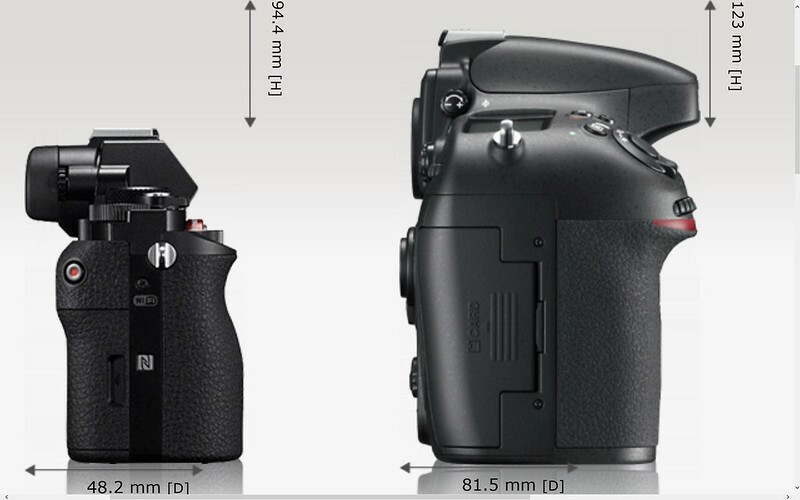 The 36MP A7R only has Contrast Detection AF, while the 24MP A7 has Phase Detection AF on the sensor (Hybrid AF).